Do you run a GTCrea8 e-Savers account? If you don’t yet, you’re on the verge of missing out on becoming the coolest dude or chick on your campus. Keep reading to get the lowdown. 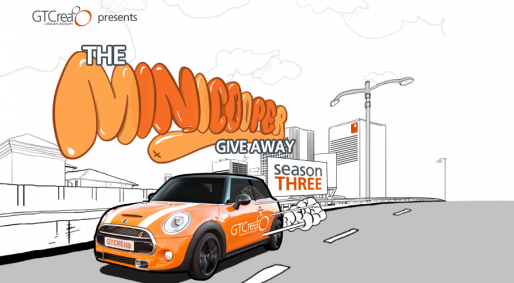 GTbank knows just how important swag is, they are giving away a brand new Mini Cooper to one sharp girl (or guy) running a GTCrea8 e-Savers account. Yes, you read that right: a brand new, fresh to death Mini Cooper. Picture yourself driving to class in that. Nice, eh? To make sure that everyone has an opportunity to win, the super-cool car will be given out through a raffle draw in December. There’s still time to make sure those car keys wind up in your hand, just follow the following instructions. 1. Open a GTCrea8 e-Savers account here now! 2. Make sure you have a minimum of ₦5000 in your account for 6 consecutive months. 3. Download the GTBank Mobile Banking app for Android, iOS or Windows Phone (on any of the app stores) and use Internet Banking, Mobile Banking or a POS for at least three transactions every month for six consecutive months. Simple, right? Now, go over the instructions again just to make sure you didn’t miss anything.